﻿ Galatians 3:10 For as many as are of the works of the Law are under a curse; for it is written, "CURSED IS EVERYONE WHO DOES NOT ABIDE BY ALL THINGS WRITTEN IN THE BOOK OF THE LAW, TO PERFORM THEM." For as many as are from works of law are under a curse, for it is written, Cursed is every man who does not continue in all things written in the book of the law, to do them. For as many as are of the works of the law are under a curse: for it is written, Cursed is every one who continueth not in all things that are written in the book of the law, to do them. 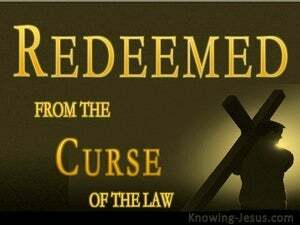 For all who seek to be right with God by trying to meet all the requirements of the law of Moses are under a curse [from God], because it is written [Deut. 27:26], "Every person is cursed [i.e., cut off from God] who does not continue to obey all of the requirements written in the law of Moses." For as many as are of the works of the law are under the curse: for it is written, Cursed is every one that does not continue in all things written in the book of the law to do them. 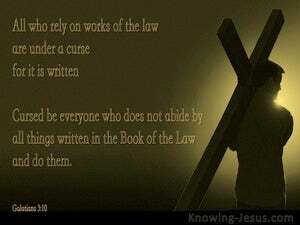 For all who are of the works of the law are under a curse: because it is said in the Writings, A curse is on everyone who does not keep on doing all the things which are ordered in the book of the law. For all who rely on works of the law are under a curse; for it is written, "Cursed is everyone who does not abide by all things written in the book of the law, to do them." but they that rest themselves upon the works of the law, are obnoxious to the curse: for it is written, " cursed is every one, who continueth not in all things, which are written in the book of the law, to do them:"
For so many as are of works of law are under the curse: for it is written, Cursed is every one who does not abide in all things which have been written in the book of the law, to do the same. For there is a curse upon all who rely on obedience to the Law, for the Scripture says, "Cursed be anyone who does not stand by everything that is written in the Book of the Law and obey it." for it is written, Cursed is every one who continueth not in all the things which are written in the book of the law, to do them. For as many as are of the works of the law are under the curse: for it has been written, Cursed every one who remains not in all written in the book of the law to do them. For as many as are of the works of the law are under the curse: for it is written, Cursed is every one that continues not in all things which are written in the book of the law to do them. For as many as are of the works of the law are under a curse, for it is written, "Cursed [is] everyone who does not abide by all [the things] that are written in the book of the law to do them." For as many as are out of works of the Law, these are under a curse; for it is written, "Cursed is everyone who does not continue in all things which are written in the Book of the Law, to do them." For as many as are under the deeds of the law, are under malediction. For it is written, "Cursed is every man that continueth not in all things which are written in the book of the law to fulfil them." Whereas a curse rests on all who rely upon obedience to the Law; for it is written, Cursed is everyone who does not hold by all that is written in the book of the law, to perform it. but a curse rests on those who have their root in the works of the Law; for it is written. Cursed is every one that continues not in all the things written in the Book of the Law, to do them. 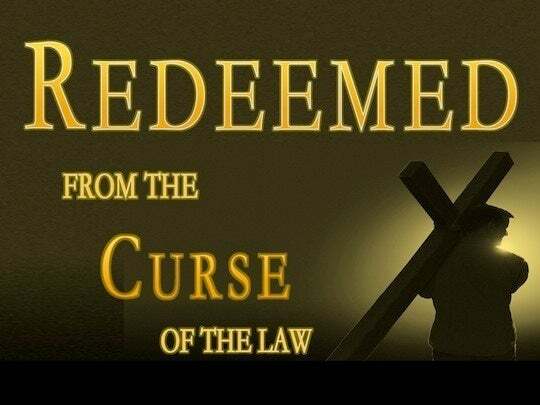 For all who rely on doing the works of the law are under a curse, because it is written, "Cursed is everyone who does not keep on doing everything written in the book of the law." For as many as are of the works of the law are under a curse. For it is written, "Cursed is everyone who does not continue in all things that are written in the book of the law, to do them." For as many as rely on the works of the Law are under a curse; for it is written, "Cursed is every one that continueth not in all things which are written in the book of the Law, to do them." For as many as are of works of the law are under a curse; for it is written, Cursed is every one that continues not in all things written in the book of the law to do them. For, as many as are of works of law, are, under a curse, - for it is written - Accursed, is everyone that continueth not in all things that are written in the book of the law to do them. For as many as are of the works of the law, are under a curse: for it is written, "Cursed is every one who continueth not in all the things written in the book of the law to do them." For as many as are of the works of the law, are under the curse: for it is written, Accursed is every one that continueth not in all things which are written in the book of the law to do them. All who are depending upon their own obedience to the Law are under a curse, for it is written, "Cursed is every one who does not remain faithful to all the precepts of the Law, and practise them." For those who depend on what the law commands are under a curse, for the Scripture says, "Cursed be everyone who does not continue in all the commands that are written in the book of the law, to do them." For as many as are of the works of the law are under a curse. For it is written, "Cursed is everyone who doesn't continue in all things that are written in the book of the law, to do them." For as many as are of works of law are under a curse; for it has been written, "Cursed is every one who continues not in all the things written in the book of the law, to do them." For as many as are of the works of the law, are under the curse; for it is written, Cursed be every one that continueth not in all things which are written in the book of the law, to do them. 9 So then those who are of faith are blessed with Abraham, the believer. 10 For as many as are of the works of the Law are under a curse; for it is written, "CURSED IS EVERYONE WHO DOES NOT ABIDE BY ALL THINGS WRITTEN IN THE BOOK OF THE LAW, TO PERFORM THEM." 11 Now that no one is justified by the Law before God is evident; for, "THE RIGHTEOUS MAN SHALL LIVE BY FAITH."